No cost for the event. Preregistration needed so we can reserve space for WAC participants. The film runs about 90 minutes. The additional program time is for Q & A with the film's director. attached map or follow the signs to the Highlander Union Bldg. Co-Director 1948: Creation and Catastrophe (2008-present). 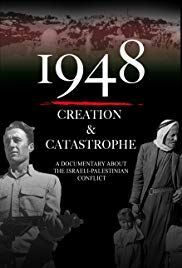 1948 tells the story of the establishment of the modern country of Israel as seen through the eyes of the people who lived it. But rather than being a history lesson, this documentary is a primer for the present. It is simply not possible to make sense of what is happening in the Israeli-Palestinian conflict today without an understanding of 1948. Hear stories from the Israelis and Palestinians who personally lived through events in Haifa, Jaffa, Dayr Yasin, Acre, Jerusalem, Ramla, Lydda and more. Download and share the flier below with friends and colleagues.